When in August 1957 the US Navy needed an advanced ASW/maritime patrol aircraft, it was suggested that a variant of a type then in production would be most suitable for this requirement. Lockheed proposed a developed version of the L-188 Electra, gaining an initial research and development contract on 8 May 1958. Lockheed's Model 186, which retained the wings, tall unit, power plant and other components of the commercial Electra, as well as much of the fuselage structure which was, however, shortened and provided with a 6.9m3 weapons bay, and there are 10 under-wing pylons for a variety of stores. The first Lockheed P-3 Orion, NP-3A BuNo 148276, was converted from the third L.188 Electra airliner by removing 7ft (2.1m) from the fuselage, flying from Burbank in August 1958. The aircraft saw extensive use as an aero-dynamics test-bed. It was eventually transferred to NASA. Pressurised for the higher altitudes, the aircraft can operate from sea level, (usually 200ft minimum) up to 30,000 ft with a speed range from 140 to 405 knots. The engines are four x 4600 hp Allison turbo-props with Hamilton Standard propellers. Maximum all up weight at take off is 14,500 lbs (6577 kg) higher than the original airliner at 127,500 lbs (57,800 kg) including a maximum of 60,000 lbs (34,000 lites) of fuel. This was followed by the Lockheed YP3V-1 operational prototype, late named Orion, which first flew on 25 November 1959. The first production P3V-1 was flown on 15 April 1961, with initial deliveries being made to US Navy Patrol Squadrons VP-8 and VP-44 on 13 August 1962, by which time the type had been redesignated the P-3. One hundred and fifty seven P-3As and 144 P-3Bs followed and production switched to the original P-3C in 1968. P-3C is powered by 4,910 ehp (3 661 kW) Allison T56-A-14 turboprops. Progressive development of the P-3C’s systems through Update I and II has led to the production P-3C Update III model. The first P-3C Update III, with IBM Proteus acoustic processors, was delivered in May 1984. Update IV will improve the P-3’s ASW capability by the use of new acoustic processing systems and Litton AN/ALR-77 tactical ESM equipment. 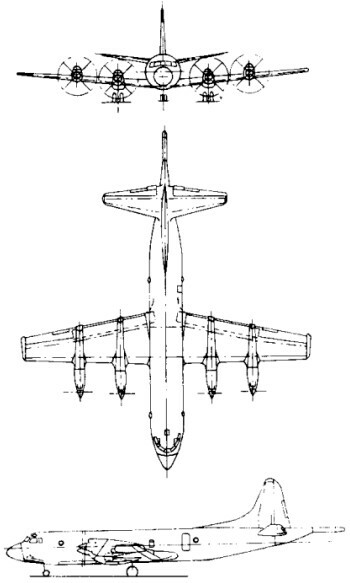 The P-3G would also feature Allison 501 turboprops in place of the T56-A-14s of the preceding model. By 1994, production in Georgia was with wings built by Daewoo Aerospace in Korea and tail surfaces by Jetstream Aviation at Prestwick in Scotland, and remaining in production in the U.S.A. until 1995. In Japan, following the assembly in Japan of four P-3C aircraft from Lockheed-built components, Kawasaki produced the Lockheed Martin P-3C Orion for the JMSDF; 101st and final aircraft delivered in 1997, when four EP-3/UP-3D electronic intelligence/training variants remained to be delivered up to the year 2000. Other export P-3s feature various equipment changes: Australian P-3Cs used Marconi Avionics AQS-901 acoustic processing; the 21 Canadian CP-140 / CP-140A Auroras have S-3 Viking avionics; and New Zealand’s P-3Bs are fitted with Boeing’s UDACS display and control consoles. The US Customs Service became the first customer for Lockheed’s P-3 (AEW&C) airborne early warning aircraft in May 1987. These aircraft will have a reduced mission system suitable for their task, while the full AEW&C aircraft would have a General Electric AN/APS-138 radar and APA-171 rotodome above the fuselage, together with a M1L1553A communications and data handling system. During 1984 Lockheed converted an ex-RAAF P-3B to serve as the AEW&C prototype, featuring the dorsal “rotodome”. Designated EP-3Es and converted from P-3As, twelve versions serve with the US Navy to provide electronic surveillance. The EP-3s are equipped with APS-120 radar plus extensive jamming, detection and analysis equipment. The significantly upgraded Australian Orions, designated AP-3C, were introduced into service in 2002 and are fitted with a variety of sensors, including digital multi-mode radar, electronic support measures, electro-optics detectors (infra-red and visual), magnetic anomaly detectors, identification friend or foe systems, and acoustic detectors. The major changes since the Orion entered service have been in avionics equipment and capability, and more than 640 have been built to 1989, with the type then continuing in production (at Marietta, Georgia) until 1995/56 for South Korea, who ordered eight P-3C Update Ills in December 1990. Other Orions were in service in Iran, the Netherlands, New Zealand, Norway, Pakistan, Portugal, Spain and NASA and NOAA. Engines: 4 x Allison, 4910 shp. Wing span: 99 ft 8 in (30.37 m). Length: 116 ft 10 in (35.61 m). Height: 33 ft 8.5 in (10.29 m). Max TO wt: 134,000 lb (60,780 kg). Max level speed: 476 mph ( 765 kph). Engine: 2 x Allison T56-A-14 turboprop, 4910 shp / 3661kW. Heavywt model MTOW: 135,000 lb (61,236 kg). Max speed: 476 mph @ 15,000 ft. Initial ROC: 880 m / min. Endurance: 3 hr on station. Max range: 7100kms (3850 NM). Endurance: 15hrs with 2 engines shut down to conserve fuel. Equipment: Rescue winch 270kg max load, nightsun search light, nightvision goggles. Armament: 2 x M60D 7.62 machine guns. Engine: 2 x Allison T56-A-14 turboprop, 4910 ehp (3661 kW). Crew: 13, two pilots (captain and co-pilot), two flight engineers, tactical co-ordinator, navigator/communication officer, sensor employment manager, six airborne electronic analysts.